For what seems like forever, Angie and I have been intending to "take a cruise" and see if it was as great as some of our friends claimed. Well folks, we finally got around to it! On April 12 we said goodbye to Richardson for a week and flew to Miami, Florida to board the Grandeur of the Seas , one of the newest and largest ships in the Royal Caribbean fleet. 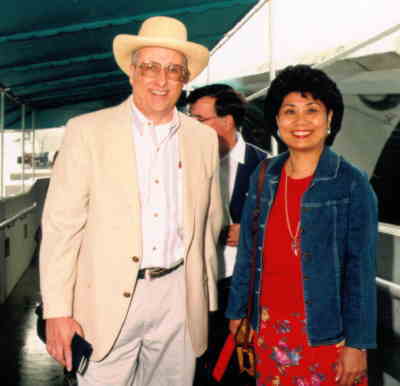 We were joined on the ship by friends from California, William and Rhona Chen and their friends Anthony and Kelly Zee. We had planned a seven day cruise, leaving Miami with first stop at Labadee Dominica, a private harbor maintained for the Cruise line. Then on to San Juan Puerto Rico followed by St. Thomas in the US Virgin Islands. 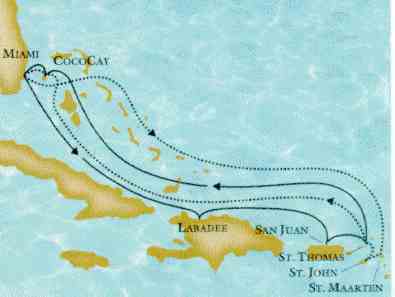 Then back to Royal Caribbean's own private Island, Coco Cay, in the Bahamas for a day of snorkeling and sun bathing. Then back to Miami. As fate would have it, political unrest prevented us from visiting Labadee (We went to Nassau instead, which was fine.) and high winds on the last day prevented us from stopping a Coco Cay. Instead we meandered back and forth in the lee of an island and enjoyed the ship's facilities. At the pier you go through a minimal immigration and customs procedure, and are given your personal "Cruise" card which becomes your all-in-one boarding pass, charge card, and room key during the cruise. Here's a picture of Angie and I about to board the ship. You get your picture taken every time you turn around, and of course they'd love to sell you a copy. I'll get around to painting the guy behind us out of the picture one of these days. 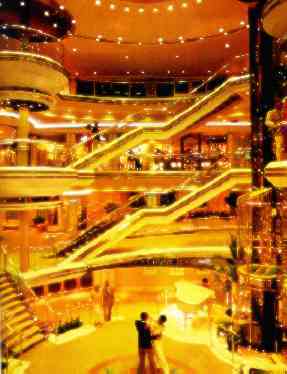 Then it's into the ship which turns out to be like entering the lobby of a high rise hotel. Huge! Glassed in elevators and all. Some nice folks then guide you to your stateroom and show you the basics. Next step is to go to the purser's desk and "activate" that personal card by putting up a legitimate credit card. 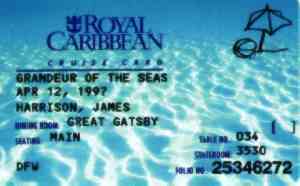 Thereafter everything on the ship is charged to your personal cruise card. At the end of the cruise you receive a detailed listing of all your charges which will be charged to your credit card. You're also furnished envelopes to use to tip your head-waiter, waiter, assistant waiter, and cabin steward. It turns out to be a nice arrangement really. Folks, this is a REALLY BIG ship! You can tell from the previous picture that the inside is pretty spacious. Well it is just as impressive from the outside. The picture below was taken at the pier in Old San Juan, P.R. It gives a pretty good idea of the length of this thing!